Last place never felt so good. Somehow, some way, the hated chicken-and-beer team of last September and the annoying Golfgate gang of last month has been replaced by a lovable bunch of overachievers who laugh in the face of injuries. The trend continued Wednesday with a 6-4 win over the Detroit Tigers on a night when the Red Sox overcame a 3-0 deficit and hit three home runs (David Ortiz, Will Middlebrooks, and Kevin Youkilis). Matt Albers picked up the win in relief and Alfredo Aceves earned his 13th save before 37,195 at Fenway. The Sox, though still in last place in the American League East, are now only 2 1/2 games behind the division-leading Orioles. While Jon Lester has sometimes stumbled in his quest to be an ace, he picked himself up after falling behind, 3-0, in the third. The lefthander kept the Tigers in quicksand for the next three-plus innings before they got to him in the seventh for a run to tie the score, 4-4. Lester thought he had his best stuff of the year. “It’s frustrating sometimes when the results don’t match the stuff you have,’’ he said. On a night when manager Bobby Valentine felt his bullpen was a little short, with one out and a man on second in the seventh he asked Lester to get one more out. Lester struck out the lefthanded hitting Quintin Berry. Albers came on, and while he allowed the tying run on a Miguel Cabrera double, the Sox were able to take the lead in the bottom of the inning on an Adrian Gonzalez double that scored Daniel Nava. 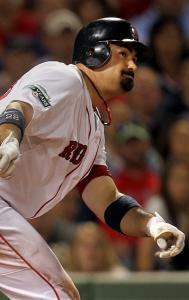 Youkilis added a solo shot in the eighth and Aceves pitched a scoreless ninth. One wouldn’t think comebacks would be the norm in a lineup without Carl Crawford, Jacoby Ellsbury, and Dustin Pedroia, who are injured. But here was another one. Ortiz continues to hit lefties, blasting his sixth homer vs. a lefty when he connected off Drew Smyly with Gonzalez aboard in the fourth. In the same inning, Youkilis singled and came home on Middlebrooks’s sixth homer of the season, giving the Red Sox a 4-3 lead. In addition to driving in the winning run, Gonzalez, who went 2 for 4, nearly made a nice sliding catch of his old Quad Cites teammate Cabrera’s double in the seventh. Nava, who is getting quite adept at playing the wall in left field, took Alex Avila’s liner off the wall in left-center leading off the seventh and threw Avila out at second, aided by a diving tag by Nick Punto. Nava practiced taking balls off the wall very close to that same spot before the game. That was a big runner the Sox got off the bases for Lester, whose pitch count was well over 100. After Laird doubled to left-center on Lester’s 116th pitch, Valentine came out and it appeared he was going to take Lester out. But he left him in and the lefty struck out Berry with a 94 m.p.h. fastball for the second out. In his 6 2/3 innings, Lester allowed four runs on 10 hits, striking out seven with no walks. He ended up at 120 pitches. The Sox, who didn’t seem interested at times a year ago, are now on the top step of the dugout watching the games closely, cheering for teammates. Little by little players are embracing Valentine’s methods, and the fact that he’s intense and wants to win. In the first inning, Lester allowed consecutive singles to Danny Worth, Cabrera, and Prince Fielder. Detroit got a run on Delmon Young’s fielder’s choice. In the third, Lester allowed a leadoff triple off the left-center wall by Berry, who scored on Worth’s sacrifice fly. That time Lester couldn’t hold the damage to a run, as Cabrera doubled. After Cabrera advanced to third on a wild pitch, Fielder got him in with a groundout to third. Middlebrooks looked briefly at the runner as he fielded the ball, but not long enough to keep Cabrera from breaking for home and scoring.